Best office chair under 100 dollars – what should you expect? In a hurry? Check out our top pick. This is the most comfortable and good looking office chair under $100. You will love it! Office chairs that cost below 100 bucks are labeled as “budget office chairs” – they’re made of affordable materials and don’t come supplied with outstanding, special features. They’re supposed to look good and make you comfortable all the while, but you shouldn’t expect anything too special. The first budget office chair in this review comes from a very reliable brand – “BestOffice”. As the name implies, these guys make some of the finest entry-level office furniture, and the best thing about it is that you don’t have to pay too much. Essentially, this chair is pretty good for casual use – it’s decently comfortable and it’s made of highly durable, sleek materials. It looks a bit too plain to be called “beautiful”, per se, as it looks ordinary and unimpressive in terms of aesthetics. On the other hand, if we take into account that this is a budget-level office chair, it looks just a bit better than certain models within the price range. The PU leather looks and feels quite awesome, but, as I said, this chair is best for casual use – sitting on it throughout your entire working hours might cause some unrest and even lower back pain, as there’s no lumbar support. Furthermore, the high-back design provides comfort and additional cushioning to your upper back, and most medium-tall and tall people wouldn’t even feel the need to use the raising lever. This chair comes in elegant black, luxurious brown (brownish, actually, looks a bit like a cross of red, orange, and brown), and luminous white color variations. Personally, I’d go with brown as it looks bossy, but other variations aren’t too far behind. The only other bad thing apart from the lack of lumbar support is the smell you might experience due to air decompression from the cushions. This smell correlates to the “new furniture smell”, and it’s bound to disappear after some time. Overall, this might be the best office chair under 100 bucks, given that it looks pretty plain, yet cool enough, it’s highly comfortable, and it’s remarkably easy to use and assemble it. Great for the cash – this office chair holds a superb value for the money, even though it’s highly affordable. Very comfortable – the PU leather materials feel gentle and comfortable all the way (note: this office chair is intended for casual use). Comes in three color variations – choose between the elegant black, the luxurious brown, and luminous white color variations. Swiveling chair – this chair can swivel up to 360 degrees. Great for larger people – people who weigh up to 250 pounds can use this chair without fretting about breaking it. Cushioned features – the seat and back area are cushioned for increased comfortability. No lumbar support – that’s why this chair is intended for casual use, as long-term sitting on it might result in lower back pain. Peculiar smell right out of the box – this chair might let out a peculiar smell after you get it, but it will disappear after a while. Here we’re looking at an amazing entry-level office chair from Flash Furniture – one of the two in our best office chair under 100 review. Basically, this chair offers slightly less comfortability, but it’s outfitted with some pretty neat features. There are three material variations for you to choose from. The first, most basic one is the plain black mesh – it’s pretty comfortable to use, but it looks quite plain. The second one is leather – actually, it’s the seat and armrests that are made of this material, the back padding is still made of ventilated mesh. The last material variation includes a combination of the aforementioned two. The mid-back design of this chair is perfect for people of average height – it’s neither too big or too small, with the back width of approximately 20”. Now, you might like the ventilated mesh back – it’s a neat little feature that contours to your upper and middle areas of your back, providing a gentle feel, even after hours of sitting. There’s also the much-needed lumbar support that takes care of the lower back issues, as well as the tilt-lock mechanism and tilt-tension adjustment knob for easier customization. This chair is fairly easy to assemble, as it doesn’t require any special tools whatsoever – you’ll still need to put your back in it, though. Among the plethora of things that make this chair great, there are certain issues that could be considered as drawbacks too. Namely, the arm height isn’t adjustable but can be pivoted upward if you don’t intend to use them. On the other hand, some people report having problems with one of the joints. Apart from that, everything else is quite great – the materials feel very comfortable, the chair doesn’t cost too much, and there are several adjustable features for a better, customized experience. Great comfortability – regardless of whether you pick the leather, mesh, or leather & mesh combination, this office chair is superbly comfortable for the price. Outstanding value – most entry-level office chairs can’t come near this model in terms of performance and comfort. Adjustable features – you can easily adjust the chair’s height, and the sway tension (note: the armrests aren’t adjustable, rather they can be pivoted upward). Mid-back design – ideal for people of average height. Incredible back support – the ventilated back combined with built-in lumbar support provide superb support for your back. Potential problems with a single joint – One of the joints won’t fall in as easy as the rest of them. Non-adjustable armrests – they can only be pivoted upward. Here’s another office chair from “BestOffice”, also made from PU leather and featuring an ergonomic design. In truth, this model and the previous from BestOffice look pretty much the same, and it’s only the features that set them apart. This office chair comes in two color variations – the black, and the brown. The seat’s dimensions include 22” of width and 21” of depth while you can adjust the height in the range of 19” to 23”. The chair is pretty sturdy and durable provided by the robust PU leather construction. Now, the seat is padded, but not cushioned properly – your lower back might not hurt after hours of sitting on it, but your tailbone might. The manufacturer advises that the upper weight limit of this chair is 250 pounds – suitable to meet the demand of larger people. Basically, this office chair is cheap, even by budget standards, and it’s one of the most affordable options in this review. Armrests are padded and feel quite comfortable as well, but the thing I really liked about this chair is the ergonomic design – the construction features precise engineering which contours to the body of the one sitting on it. It’s tough, it’s durable, it looks quite nice, and you can adjust the height at your whim. Sadly, the armrests aren’t adjustable, and there’s no built-in lumbar support, rather you’ll have to rely on the ergonomic design to avoid back pain. 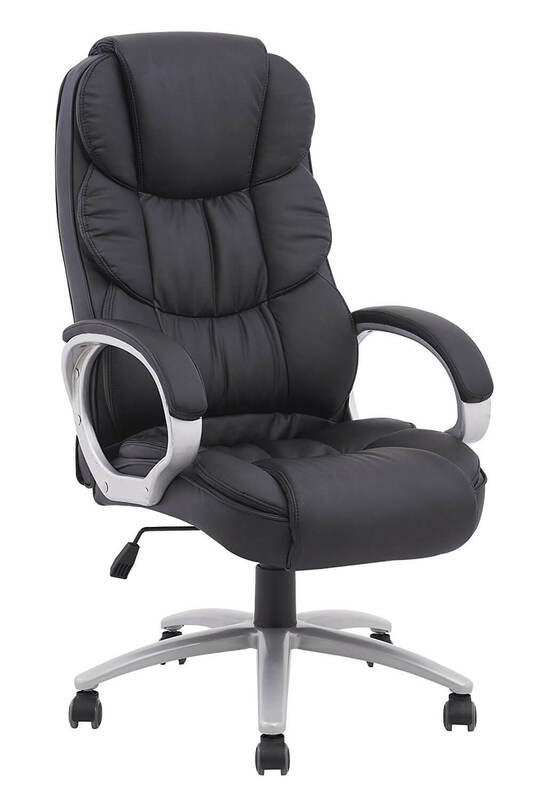 Decently comfortable – this office chair is very comfortable to use due to padded features and smooth design. Ergonomic design – the precisely engineered construction easily contours to the body, providing additional comfort. Easy to assemble and adjust – you don’t require special tools to assemble this chair. Available in two colors – choose elegant black or brown. Supports up to 250 pounds – ideal for people of every height and weight. No lumbar support – sadly, there’s no built-in lumbar support, but it’s still quite comfortable. Non-adjustable armrests – you can’t adjust or pivot the armrests. Furmax made this awesome gaming chair with aesthetics in mind, that’s for sure – this chair looks quite unordinary, and, better yet, it comes in multiple vivid color variations. The standard, elegant black is the most advertised one, but there’s also cool blue, wild green, and more. Personally, I find the “leather red” exquisitely awesome. It sort of looks like a chair you’d see in a mafia movie or something, whereas the “multi-color” brings up freshness, but keep in mind that different color variations come at different prices. As for the design, this office chair was engineered with a high-back with ergonomic design. It features leather materials and a bucket seat, as well as the padded armrests for high comfort. Speaking of which, the seat is also padded and provides smooth cushioning. The seat height can be adjusted in the range between 15 and 20 inches for more convenience. I’d highly recommend it to larger people, as it can support up to 280 pounds of capacity, which is just slightly above average, but still pretty cool. The fact that this office chair is one of the #1 best-selling office chairs in the “office drafting chairs” department means something – most people report to have zero or minor issues with it, otherwise, the statements are pretty much all positive. Now, the only bad thing that poses a potential problem is the back material – it’s quite flimsy, but if you properly use this chair you won’t have any problems whatsoever. Last, but not least, the customer service is very friendly and fast-responsive – if you have any problems, these guys will be more than happy to oblige accurately and rapidly. If the chair features any defective parts or material, you’re entitled to free replacements or repairs within six months, or if you’re having quality problems, the time is cut short to 30 days. Overall, this is an amazingly comfortable and beautiful office chair, and it’s safe to say that it holds quite a value for the money. Exquisite beauty – even though this is a gaming chair, it looks awesome. Available in a plethora of colors – choose between black, green, blue, leather red, multi-color, or Pu Red. High-back ergonomic design – this chair is specifically designed to provide absolute comfort. High supportive strength – this office chair can support up to 280 pounds of weight. Flimsy back seat – you might have some issues with the back material, as it’s not as durable as the rest of the construction. Flash Furniture never fails to deliver upon the promise of quality, and there’s a very special reason why I want to introduce you to this particular office chair. In my humble opinion, this is the best office chair under 100 dollars, as it’s beautiful, comfortable, and outfitted with a set of outstanding features. There’s a total of 11 color variations at your disposal, including black, black & burgundy, blue, burgundy, dark grey, gray, green, orange, red, white, and yellow – regardless of what color your office is, these colors will spice up and liven the atmosphere of your workplace. The medium-back design is intended for people of average height, even though both tall and short people will have no trouble using it. The back features ventilated mesh materials for absolute comfortability without cutting back on durability, but there’s also a built-in lumbar support for people who’re experiencing lower-back pain. As for the other features, the majority of them are quite plain – the tilt-lock mechanism and tilt-tension knob are easily adjustable and should be used to customize the height of your seat. The seat is neatly upholstered and padded for additional comfort. Overall, the lumbar support feels extremely good, the design looks modern, and the size is adequate. As for the bad things, the underside features plastic, flimsy materials, the armrests aren’t adjustable, and you can’t adjust the the seat forward or backwards. Great lumbar support – ideal for people who’re experiencing lower back pain. Beautiful design – this office chair was purposefully engineered to look great while being able to provide adequate comfortability. Amazing value for the money – most budget office chairs can’t even compare to this one in terms of quality and performance. Nice size – neither too short or too small, this office chair is ideal for most people. Quite durable – the majority of construction features durable materials (the only exception is the underside which is made of flimsy plastic materials). Non-adjustable armrests – this might be an issue, as you might feel a sort of “trapped” in this chair at times. The chair can’t go either forward or backwards. The last item in this small review of the best office chair under 100 models is Giantex’ high-back office chair. The manufacturer intended this chair for a number of people, including office workers and gamers, but the thing these two categories have in common is the need for a comfortable, durable chair. This one easily passes the aforementioned criteria, as it features superbly durable leather materials, looks nice, and provides a substantial amount of comfort. You can choose between black, blue, gray, and red color variations, even though the colors only change the back while the rest of the construction is always black. This is one of the few large-load office chairs in this review – it features a larger seat area for extra comfort and convenience. Overall, this chair looks pretty awesome with its race-style design which features a nylon base and a molded bucket seat, it comes in a variety of colors, and it can swivel up to 360 degrees. The only bad thing is that the backrest is too short, however. Wide seat – ideal for larger people. Very comfortable to use – the materials used in the construction process of this chair are highly comfortable. Durable construction – the majority of materials are durable and robust. Great for the price – all things considered, this is a great budget office chair. Looks awesome – the modern design looks exquisite and beautiful. Harder to assemble than most office chairs. You just have to keep in mind that these chairs are entry-level budget models. That means that they can’t compete with their higher-end counterparts in any sphere, but they’ll do the job just fine. Unlike more expensive office chairs, every budget chair lacks a certain quality – most models either look fine but feel uncomfortable, or come with great features at the expense of design, and so on. It all falls down to compromising – you should pick the one which has flaws you can tolerate and get over with. For instance, people who don’t mind having a plain, straightforward chair shouldn’t be too focused on the design. People who seldom experience lower-back pain don’t need the extra support, whereas people with chronic back pain require the much-needed “lumbar support” feature. These are all just pieces of furniture, and you don’t need any expert knowledge to determine whether you’ll feel comfortable or not in them. Always remember that you don’t have to pay a fortune to get a nice office chair. In fact, most budget models in this review are good enough to meet the majority of your needs. Each model I’ve reviewed comes with plain, yet great features, looks just slightly better than your average office chair and feels comfortable enough for you to sit through your working hours. There are plenty of things that make these chairs valuable for the cash, and the first that comes to mind is the affordability. Even though these chairs are available at a bargain price, they’re not poorly-built from cheap materials, rather they don’t have any “special” features which high-end models possess. Be it as it may, I wish you good luck in your search for the best office chair under 100 bucks and make sure to check the reviews and the comparison for quick information about the best models.